Deep fryers definitely wouldn’t be the cooking tool for the health conscious; however if you follow the principles of good nutrition where you can eat just about anything but in moderation, then deep fried foods are not totally off the menu. Deep frying has traditionally been done in a cast iron pot, some have deep fried in the traditional skillet and some like to use a Dutch oven for better temperature control, but more folks are using deep fat fryers when they want to cook large amounts of deep fried foods and when they cook these foods frequently, otherwise a cast iron skillet or Dutch oven is still a good choice when only small amounts of fried foods are consumed occasionally. Just what is a deep fryer? This kitchen tool also called a deep fat fryer is a kitchen tool that has a metal housing with a heating element at the bottom inside of the unit with electronic controls and one or two wire baskets that have handles that are placed inside of the housing that is filled with oil. The oil is allowed to reach a certain temperature, generally about 375-400 degrees and food is placed in the wire basket, which is then lowered into the boiling hot oil to fry. Many fryers have a digital readout of an internal thermometer that tells you when the oil has reached the correct temperature. Many consider this method of frying to be quick and easy. These fryers also have a spigot that allows you to drain the oil into a container for either reuse or to be discarded. The oil should of course be allowed to cool down before draining to prevent a dangerous burn. There are also mesh strainers that allow the oil to be cleaned up so to speak for storage, which should be in the refrigerator. Some cooks do choose to reuse fryer oil and some choose to start with fresh oil after frying is over for the day. The type of oil used is also important, and should be one that doesn’t deteriorate quickly with use, good oil choices are peanut oil, and light olive oil, canola oil is not a good choice since it breaks down easily and can give an unpleasant taste to the food after frying. 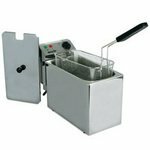 Many persons like to use these fryers for onion rings and French fries, fried mushrooms and other small food items. Deep fried foods should be dried and blotted free of excess oil before moving then to a serving platter. When looking to purchase a fryer, it is recommended by one group of professionals that a one gallon capacity fryer should be purchased, because the larger fryers are stated to heat up quickly and fry more efficiently. The fryer should also have a wide shallow basket for even cooking, and an enclosed heating element. The unit should also be easy to clean, the outside with a wet cloth, and the heating element with paper towels. These table top deep fryers also come in a variety of price ranges as well depending upon what size you want from as low as $50 to over $300 for a fryer with double baskets, so a little research is needed to determine what is best to meet your needs.